I’ve gotten quite a bit (for me) done recently so I think now is a good time to shift gears and give some attention to those topics that I’ve neglected here on Weird. The obvious starting place is Weird Art as to date there is exactly one entry in that category, though for a single post it draws a crazy amount of attention. I don’t know who goes out looking for Tellytubby nightmare-fuel but I wish I did; those are the interesting people. So to kick things off I jumped into my “horror & macabre” favorites folder on deviantART and waded through the seeping creep to a particular piece. I still remember seeing it on the front page for the first time. My mind went, “Blagh!”, and I immediately had to see it in finer detail. 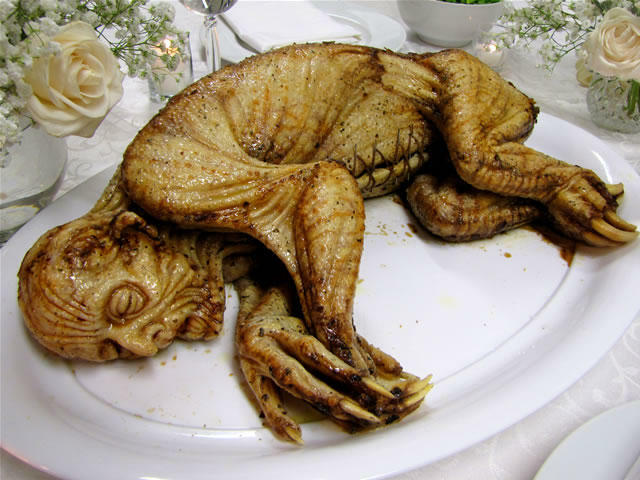 Feast your eyes on the ghastly dish that is “Funeral Meat“. You can probably see why this caught me eye. From the seasoning and charring on the stretched, baked skin to the leaking juices and sunken, shriveled face it looks good enough to eat but also human enough to make you pause and wonder if doing so would be considered cannibalism. The stitching along the belly is also nice and grisly, lending even more to the creature’s butchered-and-cooked look. The amount of time spent on referencing rotisserie chickens to get the look just right must have been ridiculous but the final result really paid off. Evan has a whole collection of really crazy work in his gallery and I’m very excited to showcase some more of them as we continue to delve into weird art.